"Jack's problem with cinema was that he could see this wonderful technology emerging and developing, and he was worried about the uses to which it was being put. Until recently, cinema has been used almost exclusively to corrupt man rather than to develop man. Some of the great movies have been terrific, but by and large most movies are just to titillate, to excite—stuff to entertain. Basically, I think the Enemy has been running the cinema. It's time we took it back from him." (Christianity Today Interview, October 2005). I wonder if Lewis would have minded this screen adaptation. It certainly takes away -and adds to - the story in a way that would make any true Narnia fan bristle in annoyance. Liberties that are always taken in Hollywood adaptations were taken. However, the argument that some creative license is necessary with the film in order to attract and hold the attention of a movie audience is somewhat valid. There is a difference between the way stories are told on film as opposed to the way that they are told in book. I'm willing to admit that some liberties need to be taken. Just not all. So what changes were made in the book as opposed to the movie? Jonathan and I re watched this film over the past weekend. The first half of it annoyed us to some degree but we both agreed that the last 40 minutes of the film is quite excellent. Given the fact that the movie ends on a good note (in our minds) we find this movie is an asset to telling Lewis' story, on the whole. The difference between the book and the movie is in the character of the Pevensie children. By that I mean their internal character traits are developed quite differently. In the book they are all committed to a.) being in Narnia and b.) rising to the challenges that they are called to with grace and dignity. In the movie Susan is almost a pacifist when it comes to war or defense of truth. (Really my problem lies mostly with Susan in this area.) Peter and Susan seem obsessed with going back home throughout the majority of the movie and that is simply not the case in the book. Lewis portrays them as heroic and noble and in the movie version you want to just lecture the socks off of them and tell them to quit thinking only of themselves. In the book they seem to understand their higher calling in defeating evil; in the movie they don't care and/or don't have a clue. This is a big problem with the movie. Lewis was a big proponent of honor and dedication to a just cause and that feeling is lost in Susan's desire to drop everything and run. I also thought the movie nicely handled Lewis's design for both his female and his male characters. When I read the books this past week and rewatched the movie(s) I noticed Lewis's design in placing the males on the forefront of battles. The boys lead the charge and dealt the physical blows, all for the sake of protecting their family and truth. The girls, on the other hand, tended for the hearts of those who went to war. Lucy administers drops of the healing liquid that she had been gifted with by Father Christmas, in restoring the wounded Narnian army. She rushes about to care for the weak and wounded. She is the one who expresses the heart and emotion of Aslan by being a nurturer. For that I greatly admire both Lewis and his creation of Lucy -- and I thank Disney for not trying to manipulate the gender roles. That much was very true to the books. The battle scene really did it for me, in securing my love and affection for this film. I think it is a good illustration of the book. Yes, it has its drawbacks but on the whole it's more of a help than a hindrance in communicating truth and safeguarding the core spirit of the books - which is to capture children's imagination for the good. The movie does that very well. Therefore I think it's worth adding this film to your home collection - so long as you add the books to your shelf as well! Admittedly, it has been over two years since I saw the movie, but I am curious about some of your points. In your assessment of the film, I totally agree that the main differences lie in the character of the kiddos. Peter and Susan have been made to be almost too "adult", or to desire to be too adult. They have difficulty getting caught up into the story in the same way good, pretend playing children would. But I confess, I did not find Peter to be particularly brave. In fact, he's downright cowardly in a couple of points in the film, and a bit of a weenie the rest of the time. HIS character change from the book bothered me the most. Also, I didn't see that the modern movie preserved the distinction between the genders and war. In fact, it went to lengths to ensure that it was simply Lucy's age that had her administering healing, and Susan was encouraged (with gift of the bow instead of a horn) to enter into battle beside her brothers. Perhaps it is time for me to watch the film again to see if my objections were valid. I confess, I found little to like in the film. 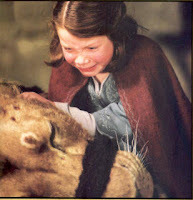 In the film The Chronicles of Narnia: The Lion, the Witch and the Wardrobe directed by Andrew Adamson there are differences from the book written by C.S. Lewis. The introduction of Father Christmas has many disparities between the written version and the film. In the film version the group consisting of Peter, Susy, Lucy, along with Mr. and Mrs. Beaver are walking along a frozen river when they hear the sound of bells and animals running, which leads them to franticly run while they’re afraid the White Witch is after them. They then hide underneath a bridge while Mr. Beaver looks out to see who is following them. In the book they were sleeping in a cave the previous night and wake up to hear the bells and become worried. Why is this scene changed in the film? The chase scene was added to the story to create an element of suspense. Viewers may have gotten into a lull in the preceding minutes. Once the action started viewers again were on the edge of the seat wondering if the White Witch was going to capture the children and beavers. The scene then set the tone for the rest of the film. Another difference in the scene is the presentation of gifts. In the book Mrs. Beaver is given a sewing machine; while Mr. Beaver gets his dam fixed. That sequence is completely omitted from the film. Why is this scene not shown? This scene was changed for few reasons. The reason that the beavers gifts were not shown was because it really didn’t add to the scene. By him giving the children presents we are led to believe that he is a kind and giving person. The children’s gifts are important because they play a major role in the final battle; however the beavers receiving their gifts don’t impact the overall story. The scene in which Father Christmas is presented in the story The Lion, The Witch, and the Wardrobe has differences between the written and film version. The main reasons for the changes is to create suspense and also the keep the story rolling along. The scene was able to create tension and leads to the climax battle.